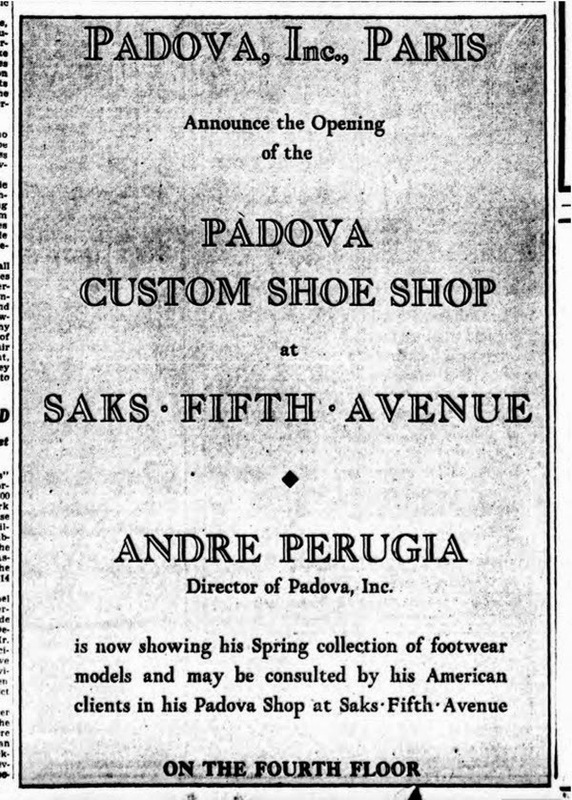 Opening of the new Padova salon at Saks-Fifth Avenue, featuring shoes at $50 to $500 a pair, is being promoted through a $75,000 Padova Exhibit of American painting and sculpture. Around exhibits of "footwear of the future" by Andre Perugia, famous shoe designer and a few of his colleagues, appear canvases by Barnard Lintott, John Sloan, August John and others. A percentage of the sale of the art works goes to Child Welfare Federation. 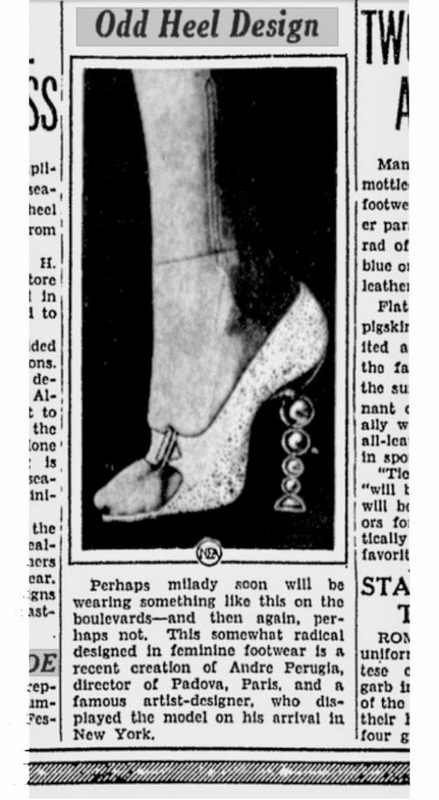 Wilma Soss, freelance publicity counselor, who supervised the opening, estimates that 2.000 women in and near New York are "willing to pay $50 to $500 a pair for shoes." Purchases, says Mrs. Soss, range from four to fifty pairs. 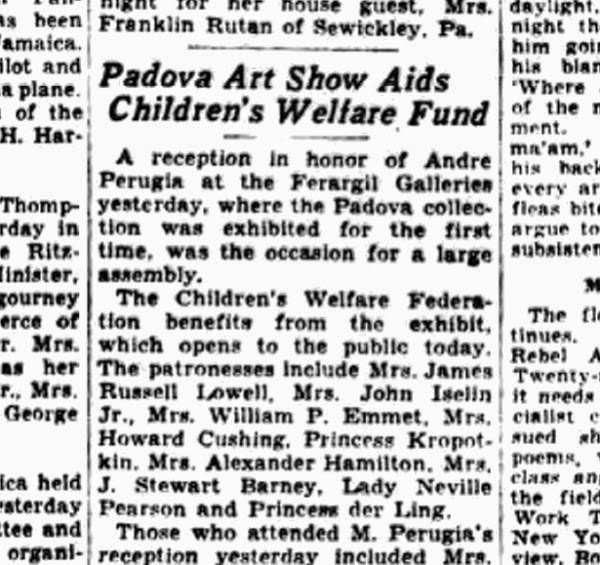 The art show was held at the Ferargil Galleries, a respected New York commercial art gallery founded by Frederic Newlin price in 1915. On monday, the Ferargil Galleries opens the Padova Exhibit of American painting and sculpture arranged in honor of M. Andre Perugia, famous shoe designer and art collector, who is in this country for a few weeks. Andre Perugia of Paris has arranged a thoroughly Parisian exhibition in the Ferargil Galleries. Wishing to call attention to his designs for ladies' footwear, he has assembled a most unusual collection of studies of feet by American painters and sculptors. M. Perugia's own work, in sandals, is beyond belief. The little shoes are almost too beautiful to be worn. This is the first appearance of the stacked spheres heel (talon a boules) made famous sixteen (16) years later by Eartha Kitt. 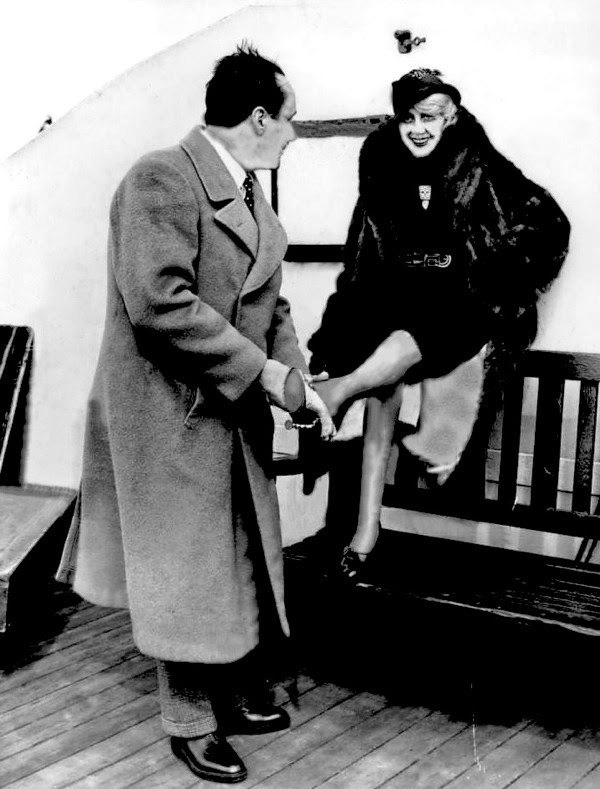 André Perugia, director of Padova, pictured as he fitted one of his creations on miss Lucienne Legrand, French stylist, on their arrival in New york, March 6th, on the S.S. Berengaria.